In the book of Exodus God reassured Moses that the starving Israelites, forced to wander 40 years in the desert, would be nourished by manna, a divine food that fell to the ground each day like dew. This painting brilliantly incorporates the veining of its stone support to convey the miraculous sustenance. 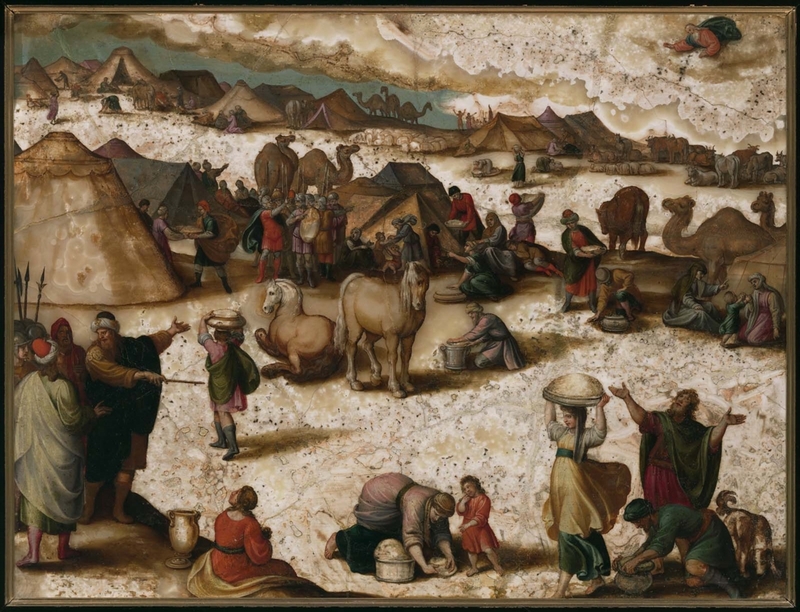 The artist carefully grouped the figures to echo the alabaster’s patterning. That this painting and its companion (MFA accession no. 2012.121) had belonged to Tupper and were purchased in 1898 from Ichenhauser is according to a label on the reverse of the painting. When they were auctioned in 1991 they were said in the catalogue to come from the estate of William van Horne. The majority of the van Horne collection remained intact and in Montreal until at least 1946.